Select seven different coloured balls/skeins of yarn and a crochet hook to correspond. I went with royal blue, baby pink, marmalade, grey, red, turquoise and purple and a 5.50 mm hook! Ch 300, work 2 tr, ch 2, 3 tr, ch 2, 3 tr into 4th ch from hook, * ch 1, sk 3 sts, work 3 tr into next st, rep from * 72 times, ch 1, sk 3 sts, work * 3 tr, ch 2, 3 tr, ch 2, 3 tr into next st, working along opposite edge, rep from * 73 times, ch 1, join with a sl st into top of beg ch-3. Rnd 2: Join new colour in ch-2 corner sp, ch 3, work 2 tr, ch 2, 3 tr into same sp, ch 1, work 3 tr, ch 2, 3 tr into next ch-2 corner sp, * ch 1, work 3 tr into next ch-1 sp rep from * 73 times, work 3 tr, ch 2, 3 tr into next ch-2 corner sp, ch 1, work 3 tr, ch 2, 3 tr into next ch-2 corner sp, rep from * 74 times, ch 1, join with a sl st into top of beg ch-3, sl st across to ch-2 corner sp. Of course if you prefer a skinny scarf work less rounds! Thanks for sharing the pattern. Looks good. Very young look, I like the different colors. Just beautiful!! I’ll have to get this on my hook next! Very pretty color combination for your lovely scarf. Very lovely, and looks super with that coat! OMG, I could so do with that right now (even tho I’m sitting inside) – it’s freezing down here in Hobart!!!!!!! Very cute! I was thinking of a granny squares scarf but I was afraid of so many squares to sew. This is the perfect solution: many colors and nothing to sew! Great! Can you accept comments in italian? Kisses from the sea of Genoa! I love the look of this! Is this something a beginner could do? I’m having a hard time reading the pattern cause I’m really new to this. What does “tr” mean? Can you clarify this more? Are all of these steps done in the 4th ch from your hook? Thanks! I love this! it is on my fall this of things to make! Sarah you are amazing. Thank you for sharing this and yes I am pre-ordering your book! This is on my to-do list now… beautiful! BEAUTIFUL genius scarf! I can’t wait for it to cool off! This will be brilliant for de-stashing my yarns! Very nice! I really like the colors. Very striking. So this is just a looooonnnnggg Granny square, but not square. Love it! I might even have the patience to pull this off! How long is this one with 300 chain stitches to start? And how wide? And for those of us who have crochet hooks with the alphabet, it looks like 5.5mm would be between H (5mm) and J (6mm). I will make one of these! I promise! 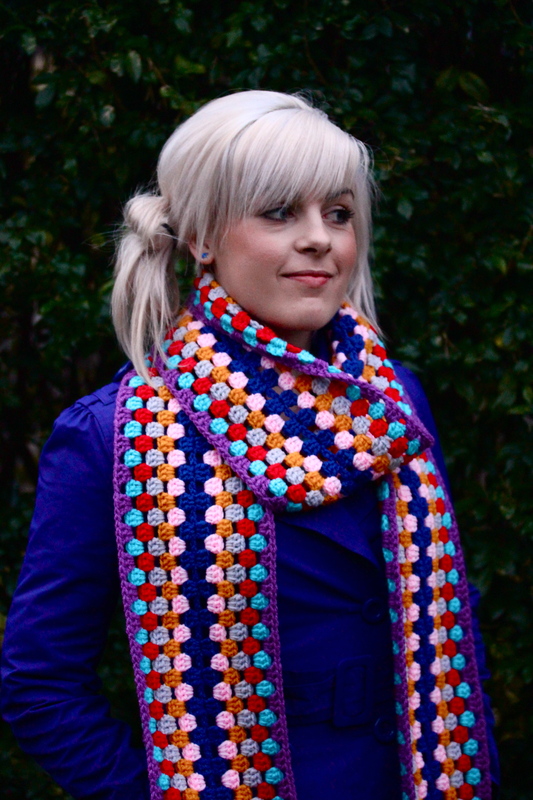 I love this cozy colorfull scarf, just beautifull! Thank you for sharing, I’ll give it a try! Mmm – lovely scarf. I would love to see what the ends look like? Hi Sarah! I LOVE your patterns! Just one question: Did you use UK crochet terms for this pattern? I really like the scarf, I’m beginning it now. What do the ends look like?